Home / Engagement rings: Custom Design / Solitaire Diamond / “Grace” Cushion cut solitaire, 1.54ct. “Grace” Cushion cut solitaire, 1.54ct. Simple designs are often the best way to make the most of an exquisite diamond. 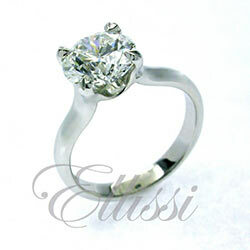 In this instance the diamond is a perfect square cushion cut of 1.54 ct.